The 2017 CLASS Award for "Friends in Faculty" went to John Wegner, senior lecturer in the Department of Environmental Sciences. A Campus Life tradition will celebrate a quarter of a century of formally recognizing outstanding staff in its own ranks, as well as honoring faculty and staff throughout the university community, during the annual Campus Life CLASS Awards banquet in May. The program invites nominations through March 26 from Emory students, faculty and staff. 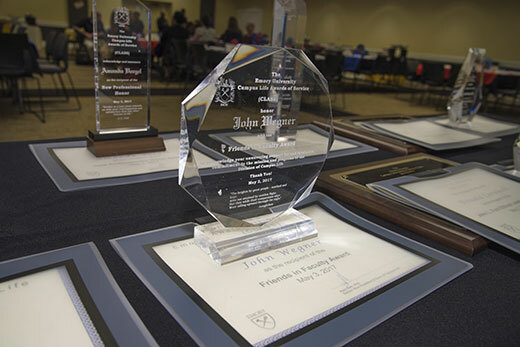 Established in 1994, the Campus Life Awards for Superlative Service, or CLASS Awards, recognize one or more Emory employees in each of eight categories. Six of those categories — spanning service, collaboration, ethics and scholarship — honor Campus Life regular staff from support roles to leadership positions. The two remaining awards are designated for faculty and staff from other Emory units. Along with encouraging professional excellence and growth, there are also other important program goals, according to Mekeshua North, senior manager for human resources for Campus Life. One is building community by bringing together the majority of the Campus Life team, which numbers almost 300 regular staff across more than 20 departments. Each spring, the CLASS Awards banquet draws more than 200 people to help recognize colleagues and collectively recommit to professional excellence. “In addition to the eight categories honoring outstanding service, the CLASS Awards program also recognizes length of service for Campus Life staff, beginning at the five-year mark and repeating every five years thereafter,” says North. Over the past 25 years, more than 260 CLASS Awards have been bestowed, most to Campus Life staff. However, the total includes two award categories for supporters outside the organization. Since 1994, 45 Emory faculty members have been honored with the Friends in Faculty Award. Since 2007, the Campus Life Champion Award (formerly Campus Life Support Award) has been presented to 10 Emory staff members outside Campus Life for their support of the organization’s work and its commitment to serving Emory students. The deadline for 2018 CLASS Awards nominations is 5 p.m., Monday, March 26. Learn more about the CLASS Awards, whom you can nominate, and in which awards categories.